Hello, all and happy Monday! Today is an exciting day for Hero Arts as they begin a new kit program – My Monthly Hero – Creativity in a box! Woot-woot! Each kit will be available on the first Monday of each month and can be purchased monthly without a subscription. The kit is available for a limited time only – once it’s gone, it’s gone, so hurry! 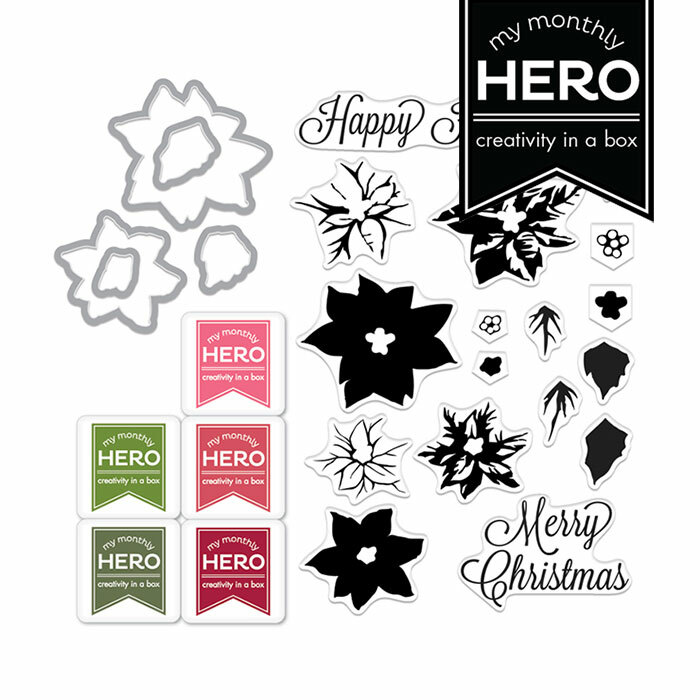 This month kit includes a color layering Poinsettia stamp set, a set of matching dies and 5 inks. 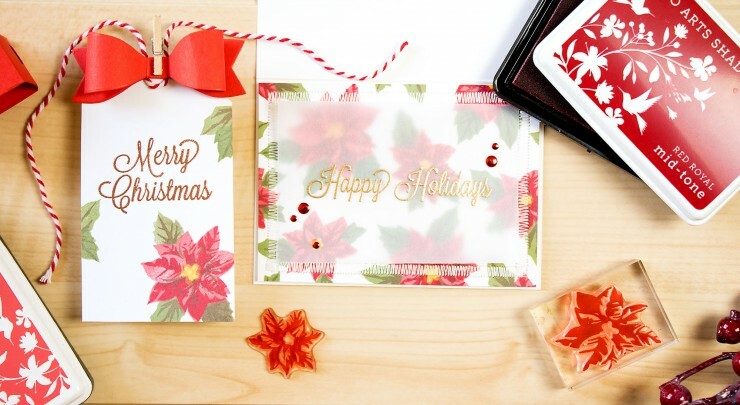 I used a stamp set from my kit to create a holiday card + gift tag combo. I started by stamping large and small poinsettias onto Hero Arts Snow White paper. I used Pale Tomato as my lightest color, Royal Red as my medium color and Cup of Joe as the darkest color; for the leaves I went with Fields Green and Cup of Joe; flower centers were stamped using two color of ink from the Butter to Orange ombre pad. I trimmed my stamped panel down and added zig zag stitching using my new sewing machine. I ended up having a very tight stitch as I am still learning how to use it, but I like the way it turned out. 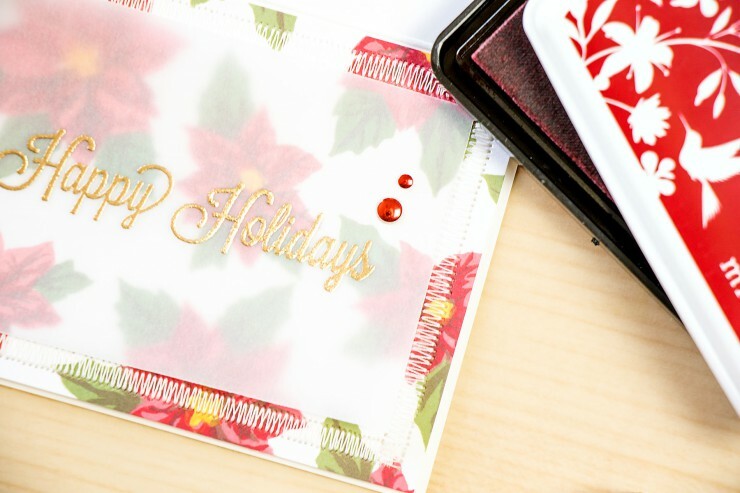 To be able to add a sentiment I heat embossed Happy Holidays onto vellum using Brass embossing powder. Vellum panel wad adhered using Scrapbook Adhesive Dual Tip Glue pen – I added little dots of glue behind the red metallic dots. The finished panel was foam mounted onto a card base using foam adhesive. 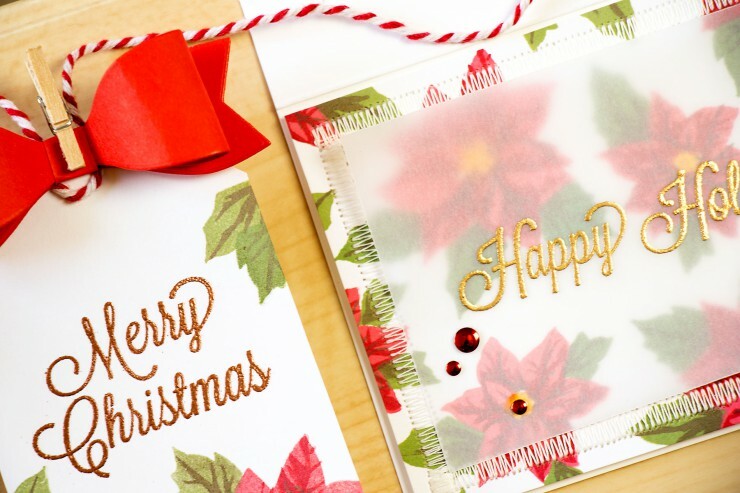 To create the tag I cut a tag shape out using my paper trimmer and my scissors, stamped a large poinsettia and several leaves using the same color combo listed above and heat embossed Merry Christmas using Copper Embossing powder. I also added a beautiful bow created using Lia’s Ribbon Cutting set, I attached it using a mini wooden peg and also added some red bakers twine for a more festive look. Another amazing set of creations Yana! Gorgeous! I can’t say which I love more; though, I’m leaning towards the vellum. thank you, Jeanne! I wanted my flowers to have more contrast (since I knew I would hide them behind vellum) so I used my go to color combo for red flowers which is Pale Tomato + Royal Red. The Cup of Joe added that awesome finishing touch to both flowers and leaves. Gorgeous! The vellum and stitching are so beautiful. Such a great kit but I’m unable to set the wp-configuration they ask for. What a shame! thank you, Graciellie! Hero Arts had some trouble with their website yesterday, it should be all back to normal now and you should be able to join the waiting list for the kit if you’d like to get it. Your card and tag look fantastic!!!!!!!!!!!!!!!!!!!! Love the new kit……such amazing cards! Beautiful projects!! Very cute tag, and I really like the vellum overlay on the card!! Gorgeous! I love how you created a coordinating card and tag. What a fabulous idea! thank you, Melissa! I simply couldn’t stop stamping these, lol! thank you, darling! I’m trying to figure out this new sewing machine of mine, still lots to learn! love this pretty set you’ve made, Yana! I love that vellum overlay. Beautiful set. WOW… Yana, the card and the tag are GORGEOUS!!! That Royal red ink is so beautiful! thank you so much, Helen! Yes, it is my most fav red color! This poinsettia is awesome! So realistic!!! The card and tag are extremely beautiful! Such a neat job!